Summary: Construction bids or contractor bids for a new home or remodeling can vary tremendously. Bids for construction can vary by hundreds or thousands of dollars for the same house. The cost to build any new home can vary and is determined by size, design, and quality as well as the city and state in which it is built. But more importantly, the cost to build new houses of the same size and location can vary tremendously due to design and quality. A range of $100 to $400 per sq. ft. for the same size house is possible! The selection and/or design of windows, doors, moldings, ceiling heights, staircases, roof shingles, flooring, plumbing fixtures, appliances, etc., all can vary the cost to build basically the same new home by hundreds of thousands of dollars!!! You both have home plans so you have already chosen the size of your new homes (as well as the city and state). Now, both of you need to concentrate on adjusting the design and quality in order to adjust the cost to build to fit your budget. Sounds simple doesn't it? It is…just time consuming. You can get an idea what changing the design and the quality of materials (as many times as you want) will result in by using the construction cost software. By adjusting the “Quality Class” feature on this cost estimating software you can obtain as many different approximate costs to build as you want until you find an approximate cost to build for your house plan that hopefully will meet your comfort level. The home design and your quality decisions need to be spelled out in writing, called specifications, so that custom home builders can bid accurately. This will require price shopping on your part, either in stores or online for as many of the items you have a control over as possible. 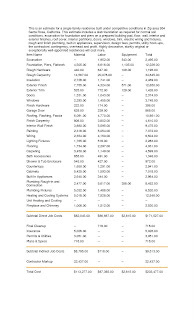 For the sake of immediacy, you could use the estimated material costs for various categories found on the estimating software to help you set allowances. 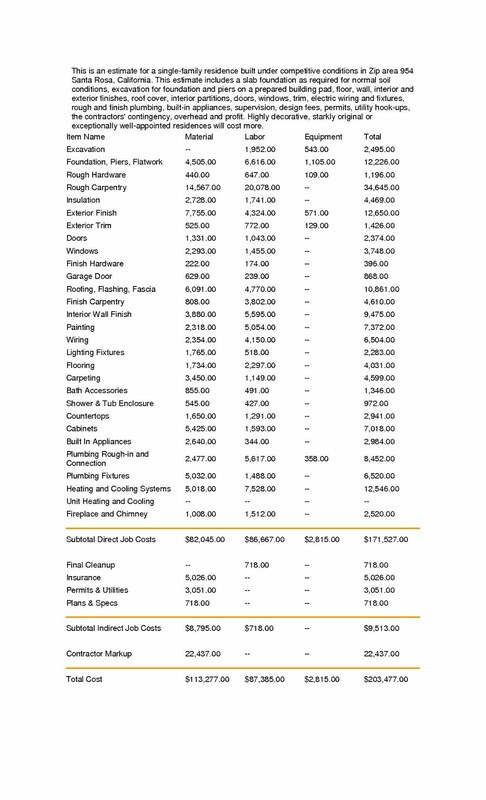 For example, on the hypothetical cost breakdown shown below, one might use $4,031 for installed flooring , $2,984 for installed appliances, $2,293 for windows (installation labor is normally included in Rough Carpentry), etc. But the more complete your specifications are, the more comfortable a home builder or a contractor is giving accurate construction bids. If a home builder, contractor, or subcontractor is not sure what you want, he or she will pad his estimate to protect himself. Next all you have to do is find a few custom home builders or contractors who will submit bids for construction using your specifications...and be willing to put those specifications in a building contract.